Galungan have profound meaning for every Hindu. Galungan day as the feast of the Hindus is celebrated as the victory of Dharma (good) against Adharma (evil). For Hindus, this is a sacred tradition that can provide spiritual guidance, gives a bright and overcome all that clutter in mind. 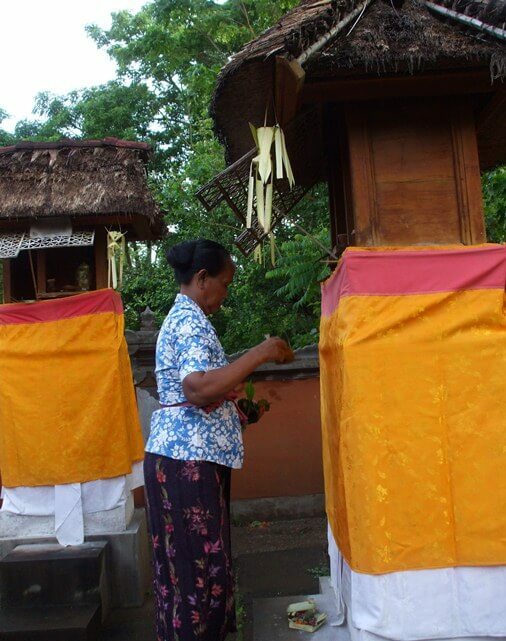 Galungan takes place every (6) six months or 210 days (Balinese calendar), on Wednesdays or Buda Pon Dunggulan. Galungan day history is mentioned in the ancient records of Lontar Purana Bali Dwipa, Galungan was first held in "sasih kacatur” or the fourth month in Balinese calendar, date of the 15th, in year of 804 Saka or 882 AD. Tumpek Wariga, (25 days before the day of Galungan / G-25), is the beginning of the implementation of Galungan. At this ceremony, Sang Hyang Sangkara is revered as the god of prosperity and safety of plants. Sugian Pengenten, on the Buda Pon Sungsang (G-7). Sugian Pengenten is a sign of the onset of "Nguncal Balung", release off all the negative traits (Adharma) and remind people to always be cautious. Sugian Jawa (G-6) invokes the sanctity and preservation of the Bhuana Agung (Universe). Sugian Bali (G-5) invokes the sanctity and safety Bhuana Alit (our self). Penyekeban (G-3), the day of "Bhuta Galungan" testing the faith, meaning that bracing yourself from negative influences, characterized by symbol of "nyekeb" or ripening the fruits and fermenting tape. Penyajaan (G-2), the day of "Bhuta Dunggulan" testing the faith, significantly more serious in releasing negative trait or called "nyajaan" in Balinese, symbolically done by making "jaja" or cake. Penampahan Galungan (G-1), the day of "Bhuta Amangkurat" testing the faith, people should be able to release off all three negative force of Sang Tiga Butha (Butha Galungan, Bhuta Dunggulan and Bhuta Amangkurat) and "nampa" or greet the coming of the Dharma (God, Holy Spirits and Ancestors), symbolized by "nampah celeng" or slaughter pigs. Followed by the installation of Penjor at entrance Balinese house. Galungan Day (G), the winning celebration of Dharma (good) against Adharma (evil). Ida Bethara (God), Holy Spirits and Ancestors descend from heaven, grant a grace to the peoples. Manis Galungan (G + 1), the Dharma Santi or visiting family and relatives. Pemacekan Agung (G + 5), is a milestone or "pacek" in Balinese, the boundary between the beginning and the end of the Galungan, starting 30 days from Tumpek Wariga (early), and 30 days until Pegat Uwakan (end). Penampahan Kuningan (G + 9), preparation of Kuningan Day, people should cautious, and release off everything that is negative. Kuningan Day (G + 10), Ida Batara descend from the heaven, people invoke the gift of the power of Dharma. Symbolically by making offerings yellow rice or “nasi kuning" and "tamiang". Yellow rice means "nguningang" or informs or reminds the descendants to continue the implement of Galungan and Kuningan. Tamiang meaningful as shield or a protection from Adharma (evil). Pegat Uwakan (G + 35), the end of the implementation of Galungan and revoke Penjor have installed on Penampahan Galungan Day. 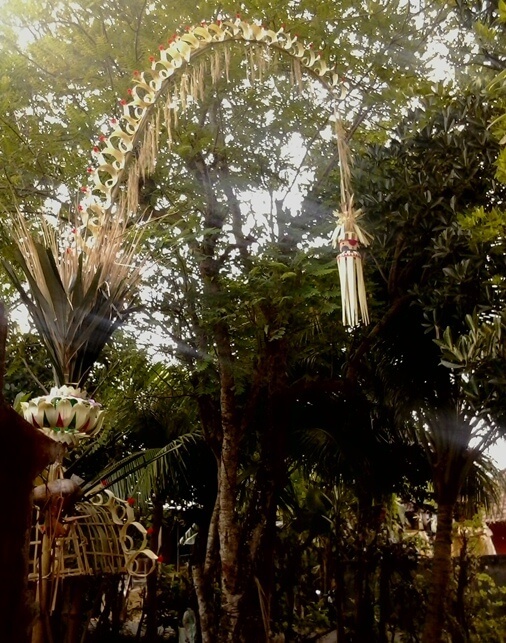 The celebration of Galungan is so evident with the installation Penjor at the entrance to the Balinese house. Penjor symbolize the expression of gratitude for the grace and prosperity that has been given by Sang Hyang Widhi Wasa (the Creator). Penjor is made of bamboo with a curved tip, decorated with yellow coconut leaves. Also equipped with "pala bungkah and pala gantung" as the grace of the creator for the welfare and safety on earth. For Hindus who have entrance that overlooking the road, penjor will be installed on the road-edge. So, it will be lined up, beautiful and colorful along the road. Galungan and Kuningan Day in Bali is truly an extraordinary moment, people wearing traditional dress, walking in the shade of Penjor that lined up beautifully, towards the temple and deliver the offering. Implement the teachings of dharma and preserve the tradition from generation to generation, for safety, welfare and protection from the Creator (GOD).